Books and films are the bedrocks of popular culture and the promotion formed a partnership between two key cultural providers in the community – the library and the cinema – and developed audiences for both. The promotion aimed to capitalise on a wave of new films based on books released in Autumn 2011, from contemporary titles such as The Help, One Day and We need to Talk about Kevin, through classics like Jane Eyre and Wuthering Heights, to current cult titles such as Twilight: Breaking Dawn and Stieg Larsson’s thrillers. 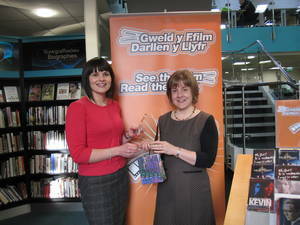 Denbighshire Libraries were awarded Second Place out of the Public Libraries in the competition. A simple but effective marketing campaign that was built around a simple but effective concept as a basis for developing an integrated campaign with an entertainment partner. The ‘seen the film read the book’ approach works well as an emotive driver for people to pick up the book. The target audience was well thought through – although I would go for ‘tribe’ – as in film tribe. The cross display and promotion works well and is a great illustration of coherent ‘brand’ management. The outcomes were well measured and are meaningful – although the budget was a little on the high side. It looks form the photos of the event as if the staff were enjoying themselves and that matters too! This campaign scored top marks in the sustainability category and as such this concept would work wherever there was a local cinema.